There are a lot of incredible window treatments out there. They give your home style and a welcoming feel, all while giving you versatile light control and privacy. What if there was a window fashion out there that did all of that plus so much more? Honeycomb Shades are this miracle product that makes your home energy efficient and saves you money! Read on to learn how this window treatment rivals others. Did you know that close to fifty percent of your home’s heating and cooling escapes through your windows? That may not be surprising. We try many things like calking and tape to seal our windows properly, but if you don’t have the right window treatment, your home will still be underperforming in terms of energy efficiency, wasting your efforts to heat and cool your home. To combat this problem, Hunter Douglas crafted the ultimate window treatment: honeycomb (also known as cellular) shades. This cellular construction is the key to their energy efficiency. The open, honeycomb pockets store air thus providing a layer of insulation to your windows making it hard for energy to transfer from one side to the other. This keeps your home cool in the summer and warm in the winter, while giving you beautiful light filtration with unique fabrics. These features allow you to heat and cool your home less, which saves you money in the long run. Duette Architella feature a honeycomb-within-a-honeycomb design for double energy efficiency, and IllumiCell is an available feature with a clear inner cell that diffuses light throughout your home. For up to 20% more energy efficiency, Duette Architella Trielle includes the largest pleat size, six layers of fabric, and five insulating air pockets. Hunter Douglas has many different styles of honeycomb shades available with unique functions. Duette is the original honeycomb style that features single or double-layered cellular construction for increased insulation at your windows. This style has been redesigned with sleek hardware that accents the beauty and vibrancy of your shade. Vertiglide is an optional feature for larger windows and sliding glass doors-a problem area for energy that is trying to escape your home. 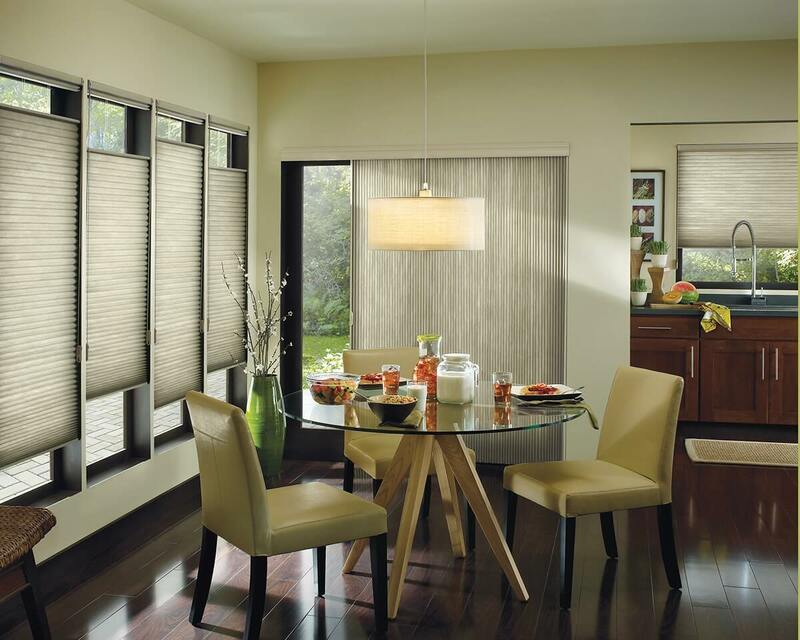 With Applause honeycomb shades, there is even more to love with triple cell construction. The extra layer of cells puts even more energy efficient construction between your window and your home. MicroSheild is a feature available with Applause shades that allows them to resist mold and bacteria. This is the first fabric used for cellular shades to offer this form of protection for your home. All cellular shades from Hunter Douglas are available in both vertical and horizontal orientations, and varying fabric opacities to meet your desired level of light control. With a huge selection of fabrics and colors among the collection of cellular shades, you are sure to find both a beautiful and energy-saving option for your home.At A Shade Above, we strive for your complete satisfaction. Visit our showrooms in Charlotte and Cornelius, NC where you can view the complete line of Hunter Douglas cellular shades and learn more about their innovative design and function. In addition to cellular shades, we offer other various shades, shutters, and blinds. We serve the greater Charlotte area and would love to help you on your next home improvement project. Contact us today!